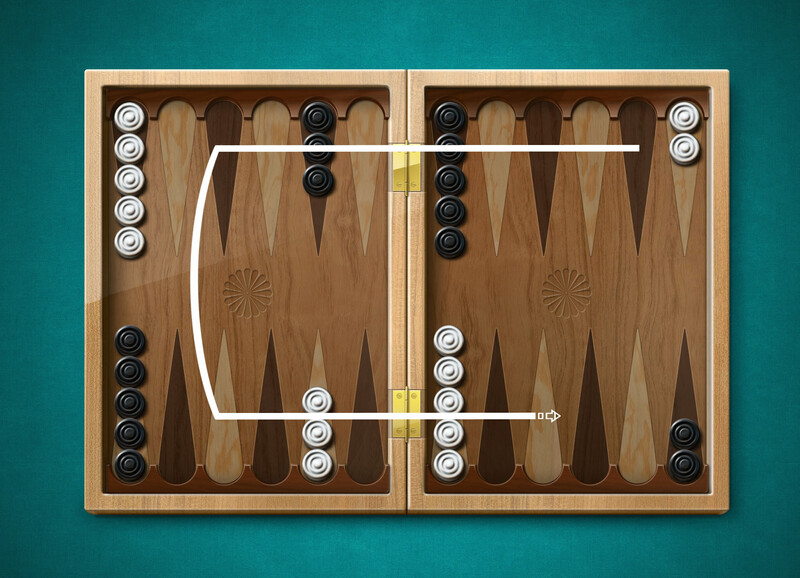 Backgammon - a game for two players on a board consisting of twenty-four narrow triangles called item. Triangles alternate in color and are grouped into four groups of six triangles each. These groups are called - the house, the yard, the house of the enemy, the enemy courtyard. The house and yard are separated by a bar, which stands above the playing field. A possible arrangement is also, mirror symmetrical to that depicted in the figure. The house is located in her left, and the yard - right respectively. Items are numbered separately for each player, starting with the home the player. The farthest point is the 24th item; it is also the first point for the opponent. Each player has 15 checkers. Initial setup of checkers is: each player two checkers in the twenty-fourth paragraph, in the thirteenth - five, three in the eighth and five in the sixth. Pict 1. Board with checkers in the starting position. A possible arrangement is also, mirror symmetrical to that depicted in the figure. The house is located in her left, and the yard - right respectively. The goal - to convert all your checkers into home and then remove them from the board. The first player who has removed all of his checkers wins the game. Pict 2. Direction of movement of white checkers. White Checkers are moving in the opposite direction. To begin the game, each player rolls one die. This determines which player goes first and what numbers for his first stroke he uses. If two players have the same number dropped, they both roll the dice as long as different values will not fall out. A player who has dropped a higher number moves his checkers according to the numbers on both dice. After the first move, the players alternately throw two dice and perform moves. 1. Checker can only move to an open point, i.e. one that is not occupied by two or more drafts of the opposite color. 2. 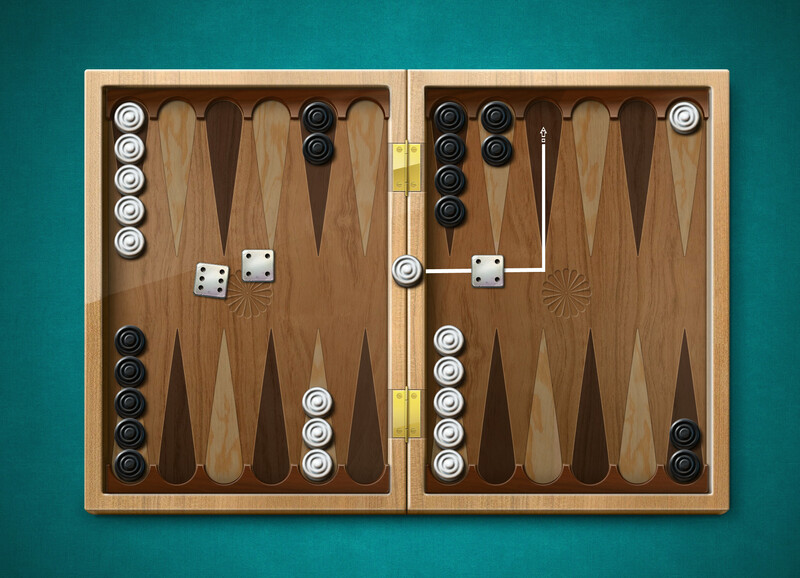 Numbers on the two dice constitute separate moves. For example, if a player rolls 5 and 3, he may move one checker on the three fields, and the other - for five, or he may move one checker directly on the eight (five plus three) of the field, but the latter only if intermediate point (at a distance of three or five spaces from the starting point) is also open. 3. Player who rolls doubles plays each of the numbers on each of the bones twice example, a roll 6-6, the player must make four moves by six points, and he may move any combination of checkers as it sees fit. 4. Player must use both numbers of which he fell, if they allowed the rules (or all four numbers, if he rolls doubles). When you can play only one number, the player must play that number. 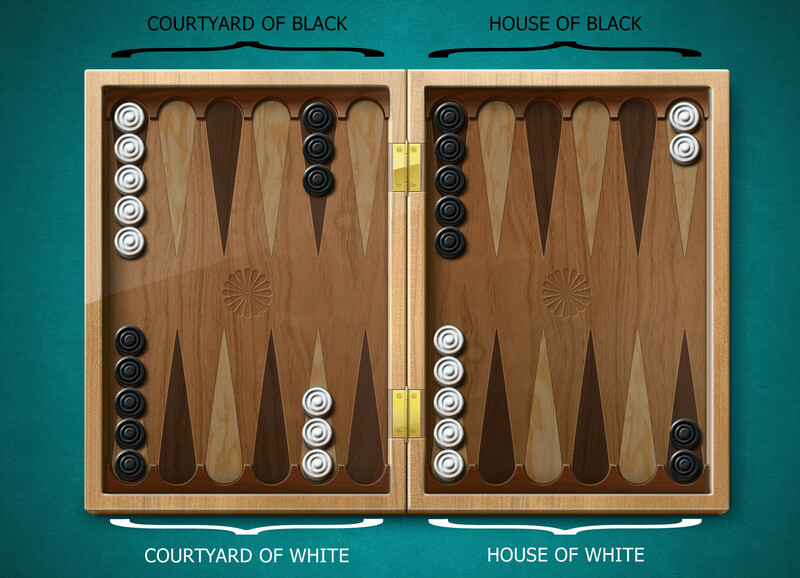 If each of the numbers separately, you can play (but not both), the player must play the higher number. If a player cannot make a move, he loses his turn. 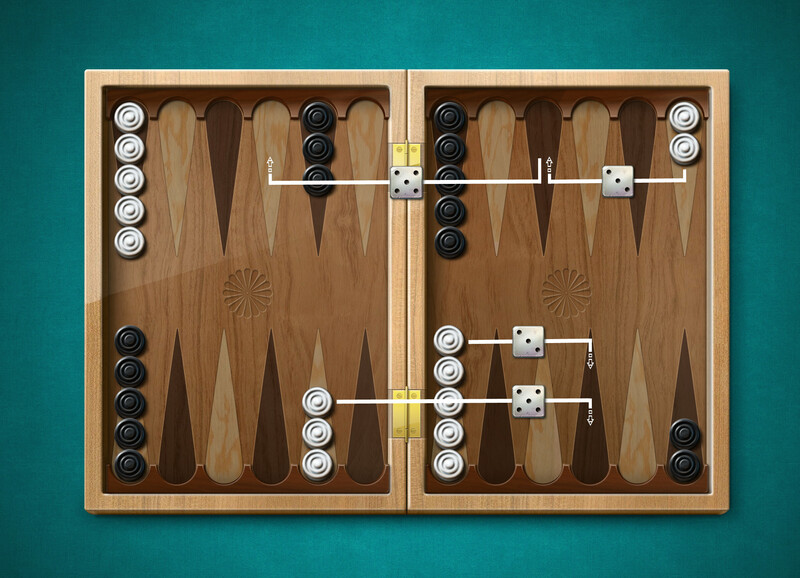 If rolls doubles, if a player cannot use all four numbers, he should play as many moves as possible. A point occupied by only one checker is called blot. If a checker of the opposite color stops at this point, the blot is hit and placed on the bar. At any time, when one or more pieces are on the bar, the first duty of the player - it's in the house to charge checkers opponent. Checker comes into play, moving to the point corresponding to the value of discarded bones. For example, if a player rolls 4 and 6, it can charge for the fourth bomb or sixth item if two or more enemy checkers does not occupy them. If both points corresponding to the values of discarded bones, busy, the player loses his turn. If the player can enter some of his checkers, but not all, he has to charge all checkers that possible and then skip the rest of the turn. After all drafts will be put on the bar, the unused value of bones can be used as usual, moving his checker, which you charge, or any other checker. When a player has moved all its 15 checkers to his house, he can start throwing them off the board. The player throws his checkers as follows: Giving a pair of dice and checkers, which are on the points corresponding to the fallen values removed from the board. For example, if dropped 6 points, you can remove the checker from the sixth item. When throwing out checkers, all the checkers must be in the house. If a checker is beaten in the discharge of checkers, the player must bring his checker back to his house before he will continue to throw them out. The one who first throws out all his checkers off the board wins the game. 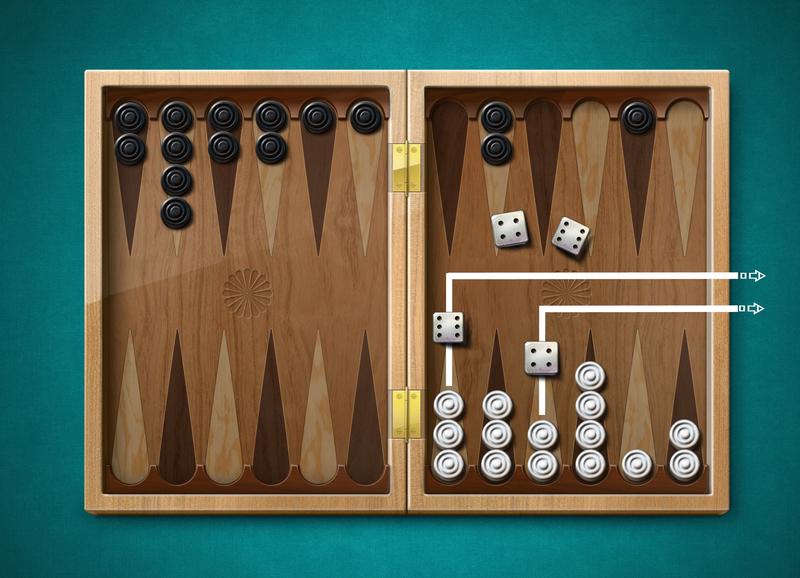 Backgammon does not have draw. If one player threw all his checkers first, the second is a loser, even if the next roll can throw all their pieces. Checkers position late in the game in which the loser had to withdraw at least one of his checkers. 1 POINT.